With every passing day, both chatbots and the automotive industry are being revolutionized in many ways. However, their development at such a fast pace isn’t the only link between the two industries. What’s important is that together they can bring about some great changes to make our lives much easier and efficient. As today’s customers are increasingly tech-savvy, it’s becoming essential for the automotive industry to invest in chatbots. Many customers are more comfortable with communicating via chat, which is why chatbots might soon develop into an integral support service in the automotive world. One of the most anticipated applications of chatbots in transportation services is in ride-sharing. We’re getting more and more used to ride-sharing services. Apps like Lyft, Grab, Uber and similar are constantly improving the quality of their services. Yet, we still need to rely on traditional human interaction for specific requests, like modifying the route or asking whether the car is pet friendly. With chatbots in the scenario, there will be no need to make calls for extra information, waste time typing messages, or struggle communicating with the driver who might, for example, not speak the same language. The booking process will become much simpler, more accurate, and quicker. As we move into the future, we will witness many changes in the area of human-to-vehicle and vehicle-to-vehicle communication. Last year’s Auto Expo 2018 introduced one such change in which we will be communicating with our cars through chatbots. Maruti Suzuki unveiled a new technology based on AI where chatbots were applied to make cars more intelligent. The chatbot was used to provide useful information about the event as well as the latest Maruti products and services. The participants had the opportunity to ask questions and experiment with voice commands. While this might have been a show gimmick for now, it definitely displays Maruti Suzuki’s interest in the technology and their commitment to incorporating the latest innovations in the field. Their team has already announced plans to further develop the system with navigation and driving assistance applications, once it is ready for use by the general public. While this application is currently in the stage of infancy, it might soon become the most widely used one. Chatbots can be used for a number of diagnostic purposes such as verifying if the vehicle is working properly, checking the fuel levels and analyzing fuel consumption. In the future, chatbots might be responsible for sending you automatic notifications if something is wrong with the car, no matter how small the defect is. It might be a very useful and convenient option – for example, if you leave your lights on or are running out of gas. Many such chatbots have already been launched. Various projects, such as YourMechanic, have been helping car owners calculate repair estimates and book appointments with mechanics. The app can even be used for taking expert advice from certified mechanics. For decades, we’ve all been waiting for self-driving cars as they’ve always been a sign of a modern and developed future. However, every time we hear of a new project, we wonder if – realistically – these vehicles will really be of good, practical use. The integration of chatbots into autonomous cars is surely going to address such concerns to a great extent. Chatbots can be useful for choosing traffic routes, avoiding busy roads, and ensuring the safety of passengers. In fact, the chatbots will have to be a necessary part of self-driving cabs because when the car doesn’t have a driver, the customer will have to connect with the cab through a chatbot. It can be seen that together, chatbots and the auto sector will quickly change our lives and the ways in which we interact with our vehicles. The potential applications are exciting, so chances are that they will be worth the wait. 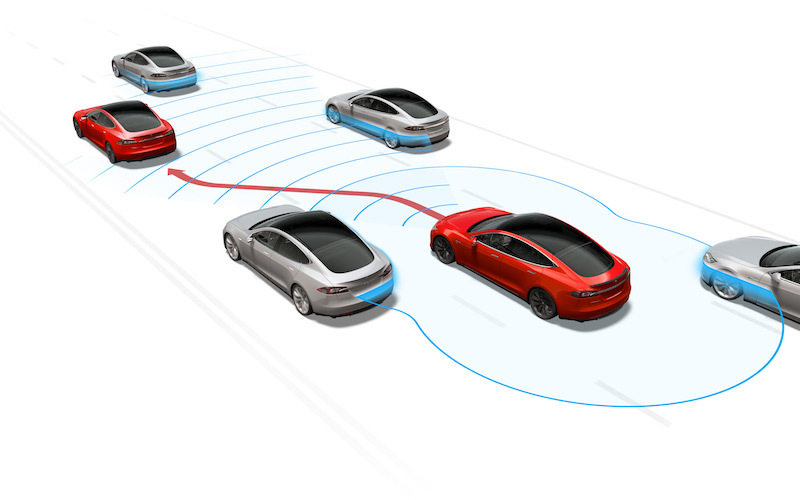 Feature Image courtesy of Tesla.